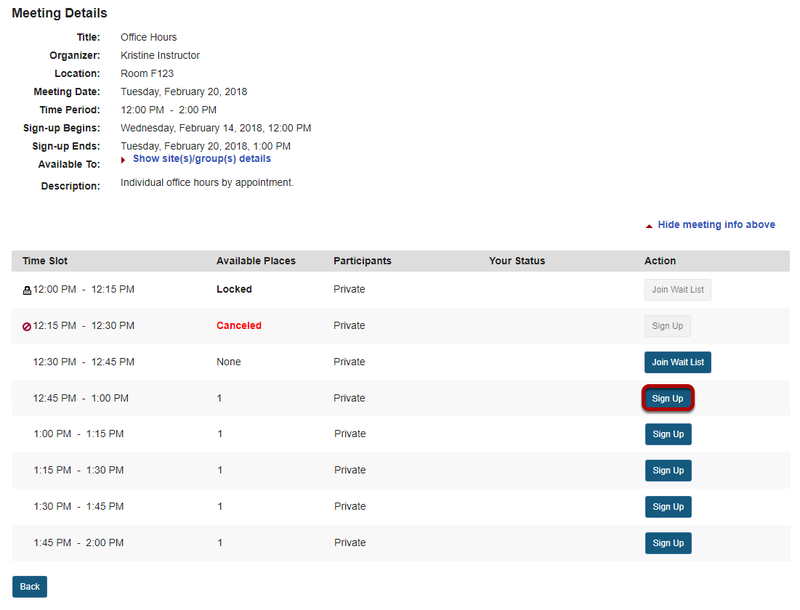 Sakai Community DocumentationSakai 19 User Guide (English) Sign-UpHow do students or participants sign-up for meetings? 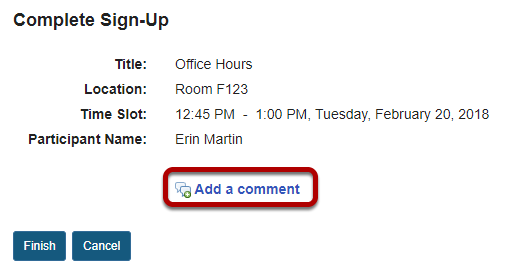 Note: If a Meeting Status message shows that the meeting is not yet open to sign-up, note the beginning sign-up time shown. Click the button labeled Sign Up beside the time slot you want. Note: If a lock icon appears in Meeting Details next to a time slot, your instructor has removed that time slot from further sign-up. If your instructor has allowed, you will see a comment field where you can type a message, which is seen only by the instructor. Once you have signed up, you will see Signed up in the Your Status column for this meeting. If the meeting is full and your instructor has given the Wait List option, you will be able to add your name to the Wait List by clicking Join Wait List. If space becomes available, you will be added to the list of attendees, and notified by email. You may cancel any appointment you have signed up for, within the time period allowed by your instructor, by clicking the Cancel Sign-up button. Prev: How do I copy a meeting? Next: How do I export meeting data?